REVIEW: If your usual colouring pencils just don’t wash, it’s time to grab the new Karat Aquarell 125 set. 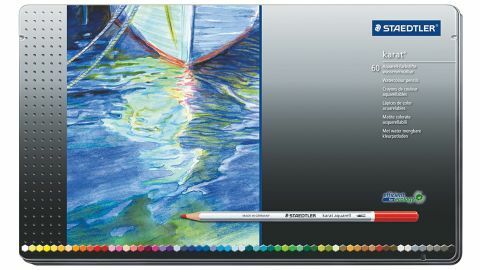 Comfortable to use and capable of delivering a range of quality artistic results, Staedtler's watercolour pencils are of the same high standard we've come to expect from the leading pencil brand. Staedtler is ubiquitous, an instantly recognisable brand of pencil, with its name and logo as synonymous with reliability as the ‘Made in Germany’ stamped along each shaft. The Staedtler company, founded in 1835, even lays claim to inventing the colouring pencil, so it should have an insight or two into how to make the best pencils on the market. This Staedtler Karat Aquarell 125 set of 60 professional watercolour pencils comes laid out in two trays within a stylish metal tin, and is perfect for studio use where you need a vast array of colours close to hand. They’re also available in sets of 12, 24, 36 and 48, but don’t forget you can always decant a more limited palette for plein air use. The watercolour pencils are the classic hexagonal shape, which helps you to hold and manoeuvre them easily and comfortably. They lay colour down really nicely, and the high pigment content of the break-resistant lead is clearly evident. The wood of the shaft is also top-quality, so sharpening them isn’t a problem. You can use them dry like normal pencils or blended with water but of course, being watercolour pencils, the real fun comes when you add water. Try experimenting with how much rich colour you lay down before adding water, or with working back over washes with the pencils, as you can come up with many stunning different effects. Being water-soluble, they’re great for blending washes too. Expect the colours to dilute a little when you add water. There are plenty of watercolour pencils on the market, some flashier brands being more expensive, but you don’t always get what you pay for. Sometimes it’s the safe and reliable ones that are worth the investment.